Samantha Brick became something of a household name last week, but for all the wrong reasons. In an article entitled ‘There Are Downsides To Being This Pretty’: Why Women Hate Me For Being Beautiful, Brick went on to describe (in a remarkably earnest tone) how her purportedly stunning looks had had a negative impact on her life, leading her to having no close female friends. The social media backlash was gargantuan – a number of spoof articles, penned by men and women alike, ridiculed Brick’s column, and Twitter feeds were soon filled with diatribes; some good-natured enough, most less so. But you could be certain that everyone had visited the Daily Mail’s website to read the article before offering up their take on this latest internet sensation. Like a Bull in a China Shop….. While marketing gurus might conceive meticulous strategies to generate buzz about their new promotional hashtag, Samantha Brick simply breezed into the Trending Topics in the same manner with which an X Factor winner might casually attain the Christmas Number One. The implication being, of course, that notoriety will take you a lot further than genuine skill. Call it the “Liz Jones Effect”, if you will. A regular columnist for the Mail’s “Femail” blog, Jones provides insights into her life that frequently spark bilious responses from readers. In the midst of one such uproar, to do with a particularly divisive “sperm stealing” article, URLs were shared on Twitter that would allow individuals to read the offending article without contributing to the Daily Mail’s traffic figures. Which leads to the question; are these incendiary editorials merely a new means of search engine optimisation? If so, the Daily Mail (or, as dubbed by the masses on Twitter, the Daily Fail) seems to have fixated on the rather broad idea that internet commenters are bursting at the seams with poison, and so all they have to do is introduce a morsel of content that is remotely odious or objectionable in order to see their click rate go through the roof. The evidence would certainly support this theory. Other sites have learned this trick, too. 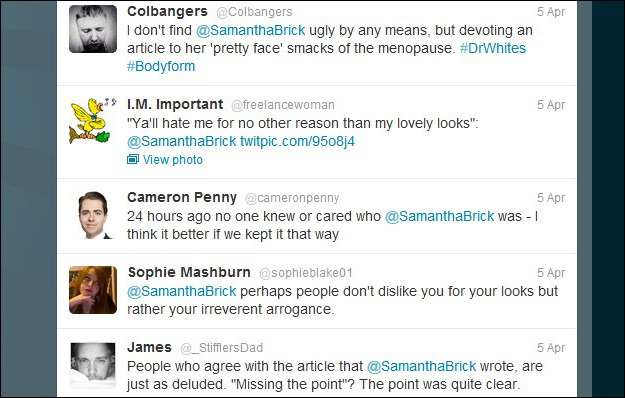 A number of online newspapers and blogs that posted opinion pieces about Samantha Brick, both to defend or vilify her, popped into existence in the aftermath of Brick’s article going viral. It is a tried and tested technique; weigh in on a topical debate, and you are reaching a built-in audience. The danger here, of course, is that by attracting your readers through such content, you will ultimately alienate them. Samantha Brick and Liz Jones are good for a laugh in a “car crash” sort of way, but providing the blogosphere with one pantomime villain after another on which to heap ridicule is hardly a sensible or sustainable strategy. That said, with an unapologetic Samantha Brick making appearances on This Morning and The Today Show, and the Daily Mail publishing further articles in her defence, maybe it’s true what they say about there being no such thing as bad publicity. My Social Agency is a digital marketing agency specialising in Social Media Marketing, App Development, Web Video Production and SEO. Get in touch today with our teams in Leeds or London to learn more.